Many handspinners and felters like to start with a raw fleece which they can prepare themselves. In the Sources & Stockists of British Wool section there is a page for British Fleeces. However a frequent question is "what are people looking for when they buy a fleece?" 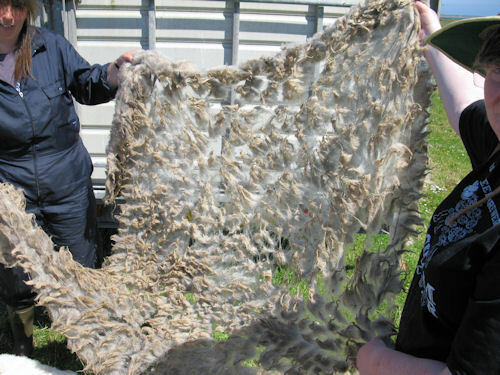 A very sensible question, since good fleeces for hand spinning need to have certain qualities, and farmers wanting to sell fleeces direct to hand spinners need to know what the spinners will be looking for. One phrase that does crop up is 'the lace curtain effect'. This means that the locks of wool separate so easily from each other that when you hold a fleece up it starts pulling apart and you can see right through it. Here is the same fleece held up and starting to separate to the point of almost falling apart. This is what hand spinners are looking for. 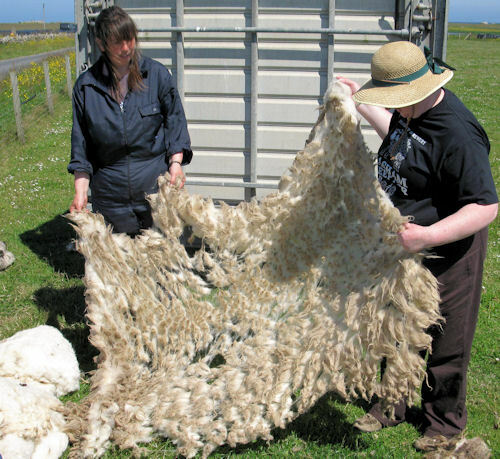 Here are some links to web pages, blogs, and articles that explain what an idea handspinning fleece would be like and how farmers can make minor adjustments to their shearing to maximise the value of their fleeces for handspinners. Note - Liz's article on assessing fleeces can now be downloaded as a pdf here. There is also a section on Assessing a Fleece, with photos, in the Start Spindle Spinning CD by Liz Lovick, that can be ordered online. The Knitting Genealogist blog post Wool Sort 101 Very detailed post with lots of photographs about how to deal with a fleece from unwrapping to washing, with some extra historical information on the subject.